I came across with a recipe for a vine leave and meat stew in an old Persian cookbook. 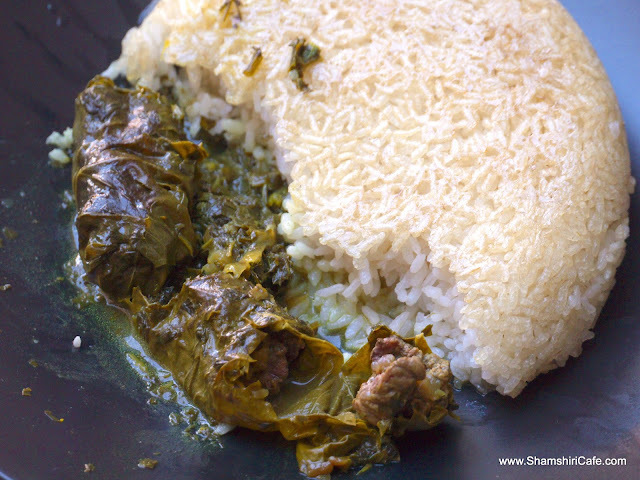 The old manuscript has a Persian title that can be translated to “A feast of all the food.” The book is one of the most, if not the most, uniquely documented available books written on the subject of old Persian cuisine. The book is a report by Naser al-Din Shah Qajar’s personal chef (Ali Akbar Khan). The monarch was from the Qajar dynasty line who reigned long, for almost the entire second half of the 19th century. 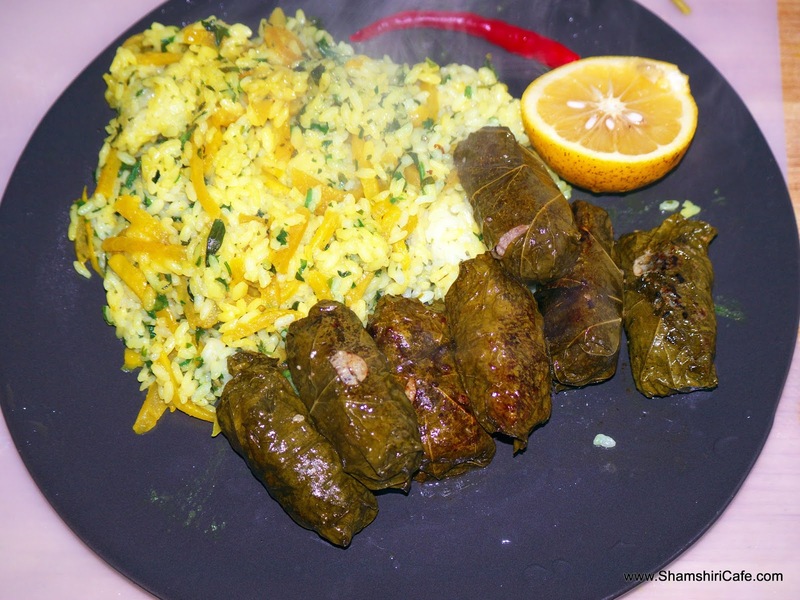 The aforementioned report was ordered by a French doctor, whose name was JosephDésiré Tholozan, who needed to assess Iranian people’s dietary habits in order to offer modern cures. 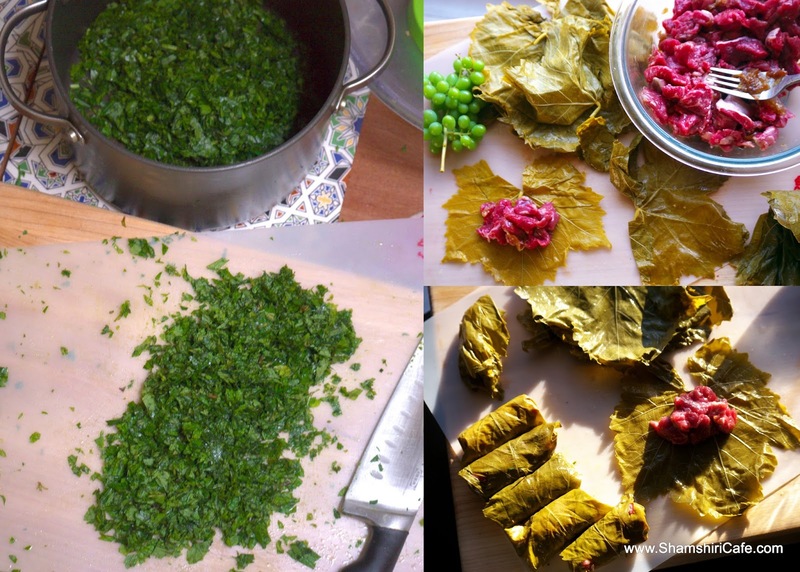 The report is long and well detailed – like many old cookbooks however, there are no exact recipes and only the ingredients and the process are described. Many of author’s reported recipes are still standing strong in the contemporary cuisine, some have evolved; a few, like the following, are forgotten. 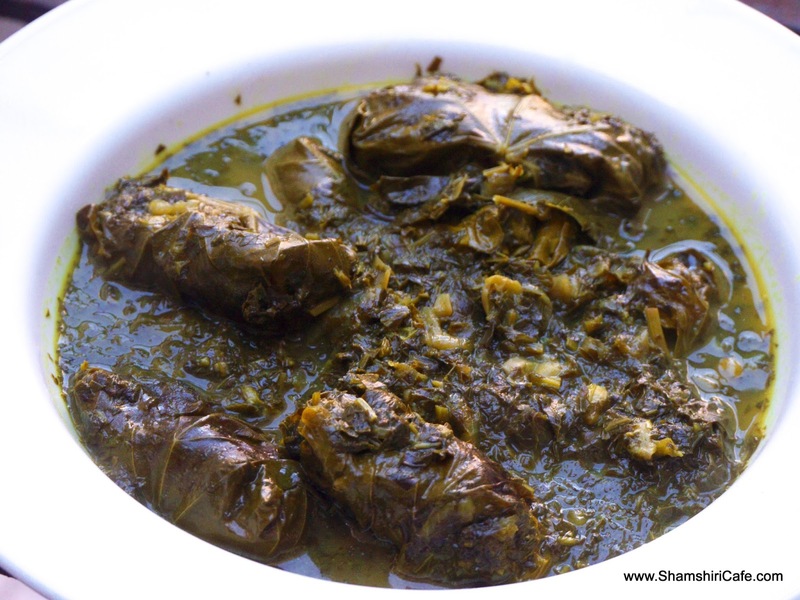 Following those instruction in the book, I came up with this recipe for vine leaves stew. 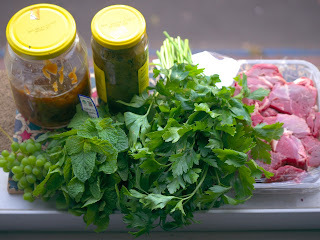 Cut the herbs finely. Transfer to a saucepan and set on medium heat and add the oil. 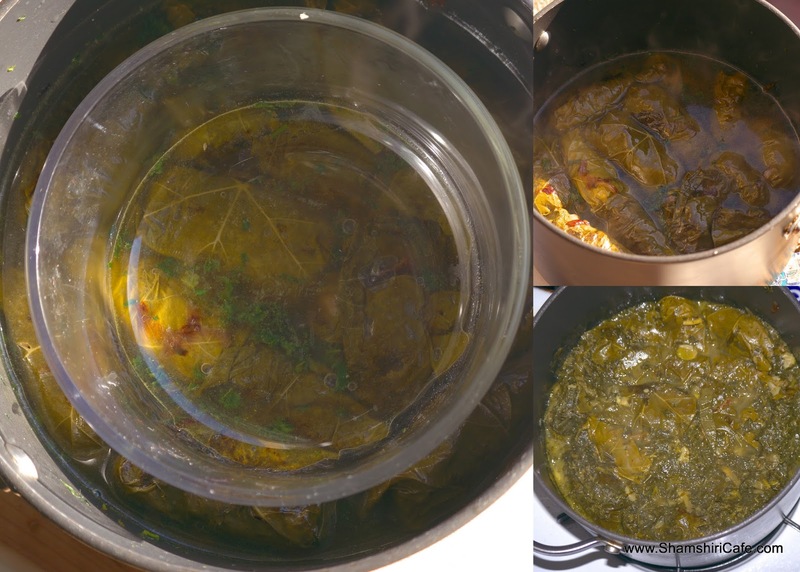 As soon as the herbs are dry, all the moisture evaporated and the oil reappeared, add the turmeric. Toast the herbs until slightly charred. Add the sour grape and enough water to stew the meat. Set aside. Using a knife, very finely chop the meat into a coarse mince. You can alternatively use a food processor. Mix the meat with caramelized onions and season. Similar to the preparation of stuffed vine leaves, put a spoon of the meat mixture on a leaf and roll up. Lightly sauté the stuffed leaves in a hot pan, one minute per side. Charred leaves infuse a unique flavor into the stew. 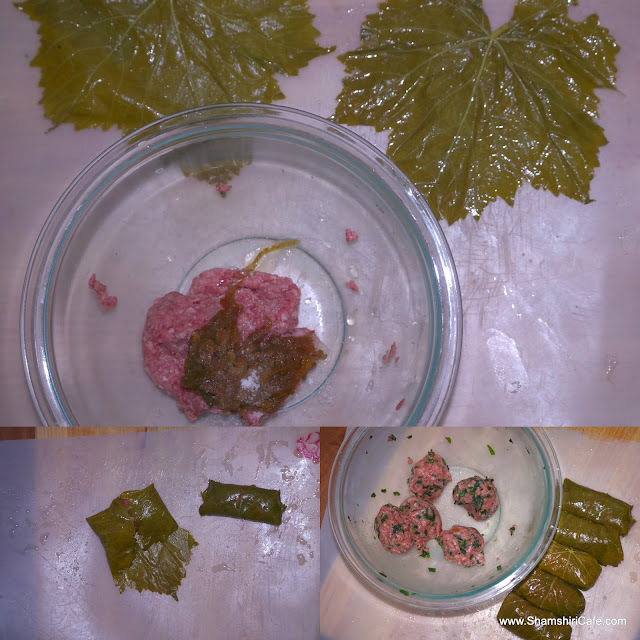 Transfer the stuffed leaves to the herbal mixture pot, making sure the stuffed leaves layer is tight (otherwise the bundles will be unwrapped during the cooking). Put a heavy object on top to avoid unwrapping of the leaves. Cook for 30 minutes on medium low heat. 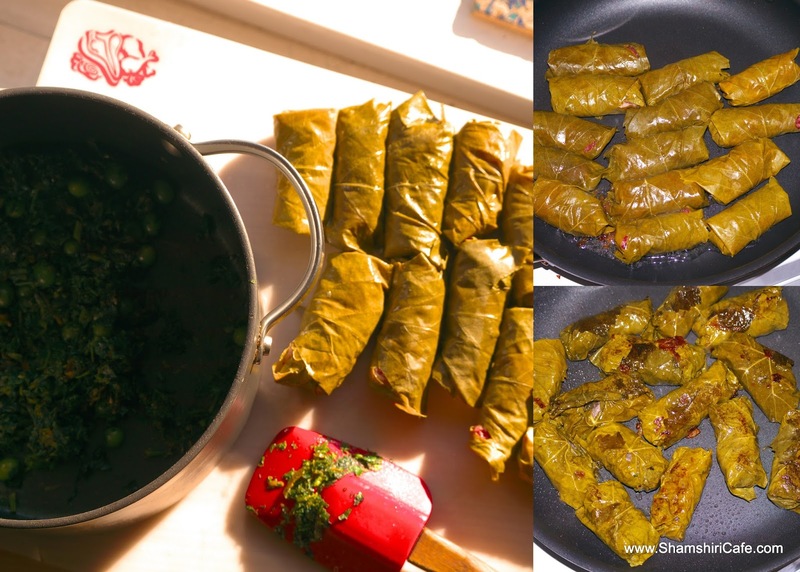 You may extend the idea to pan fried sausage stuffed vine leaves.